A good news story: Eyebrows, Lily Belle, and Swiss Cheese worked hard all season on a woodland reclamation project in Prospect Park, Brooklyn, New York. Their job? Eating massive amounts of poison ivy and invasive species. “They were very productive”, said the project’s chief landscape architect. No wonder. Endowed with very large stomachs, they can eat 25% of their body weight every day. Yup, Eyebrows, Lily Belle, and Swiss Cheese are goats, and they provided Prospect Park with an environmentally safe option for clearing land. Kudos to the Park for not choosing the popular, faster and cheaper option, the toxic herbicide Roundup. The World Health Organization’s International Agency for Research on Cancer found that glyphosate, the principle component of Roundup, is “probably carcinogenic to humans”. Moreover, the goats were a big hit with Park visitors. Figs require alkaline (sweet) soil. I raise the pH of my acid soil by amending with lime and, when available, wood ash from the fireplace. With a leap of faith I planted Hardy Chicago in the ground, rather than in a container I could move inside at the first sign of frost. Yet, fearing winter damage, I provided protection by surrounding the tree with chicken wire and dumping loads of oak leaves into the enclosure. 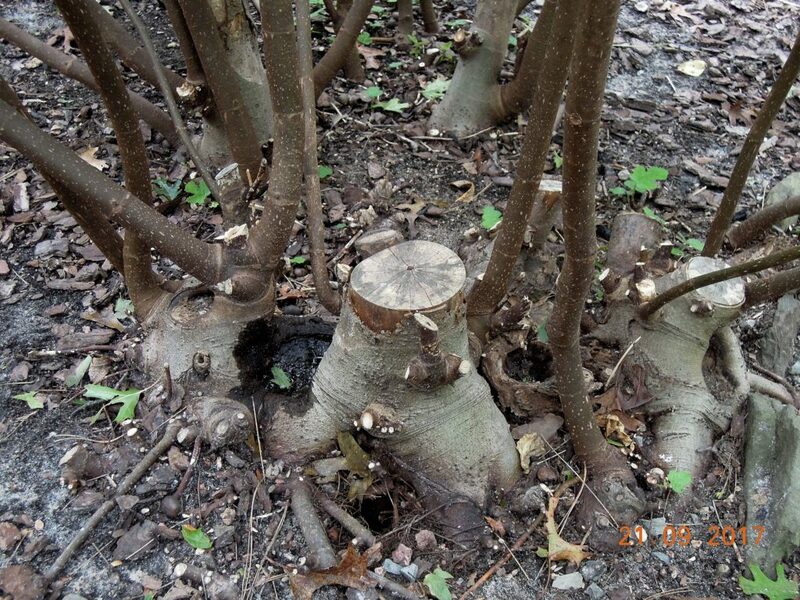 In the Spring, the fig stems were alive but I was left with an unpleasant mess to clean up. So much for winter protection. I decided to trust Hardy Chicago to be true to its name. And so it was. Over two decades the tree prospered without protection. It did suffer winter damage twice, but each time recovered in the Spring and produced fruit. That is until 2016. After an extraordinary, abundant harvest in 2015, the tree stems died to the ground in the winter of 2016 and the sparse, new stem growth in Spring produced no fruit. Not one fig. This winter I’ll provide protection, but not with conifer branches: The tree is now much too tall and wide. 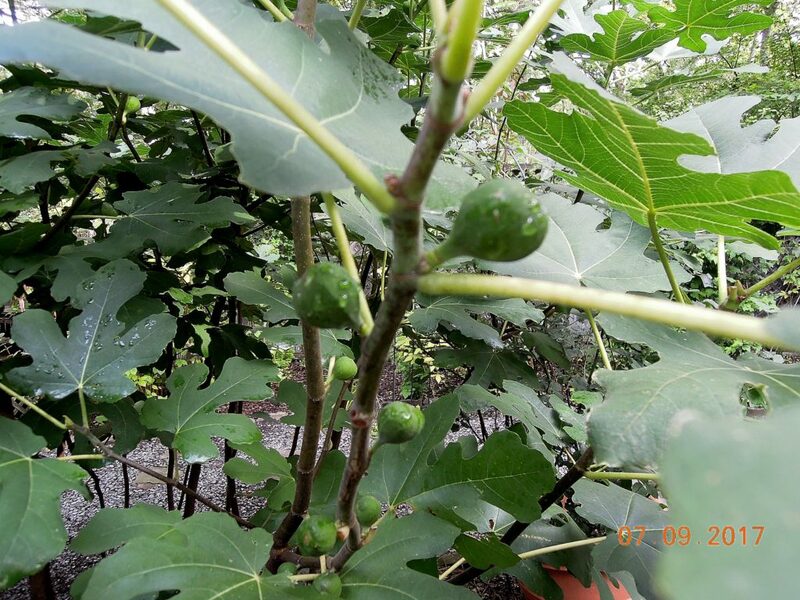 But if you are growing a small fig in a container and want to leave it outside over winter, cloaking it with conifer branches could work for you. I may return to the messy drown-in-oak-leaves-approach. I purchased my beloved Ficus ‘Hardy Chicago’ mail order from the nursery Edible Landscaping in Virginia. Check out their online catalog selection of fabulous fruit, berry, and nut producing trees, shrubs, and vines. This entry was posted on October 28, 2017, in Autumn Fruit and Color, Organic Gardening, Trees and Shrubs. Bookmark the permalink.